Most programs are designed to start with something, usually the size and orientation of the paper, the font style and size, etc. These are considered the DEFAULT settings. Most default settings can be changed to cater to your own personal needs. As an example, let say you generally write long letters and are often end up with a two page letter and only a couple of lines on the second page. In a situation like that, you might consider changing the default margins settings to 3/4" (0.75). Paper size: 8½" X 11"
If a large amount of text is to be deleted. Once you have created a document, you will want to save it, so that you can go back and edit at a future date. Use Save As to save a document with a new name. If you have already saved a file, this procedure will allow you to tear a file apart without having to worry about loosing any past work. You can also save the file to a different directory, or save it in a different format. You should use Save periodically to avoid losing your work if a power or system failure occurs. The Backup features (default = 10 min) also helps avoid losing your work if the computer crashes. If this is a first time save, all three methods will cause the Save as dialog box to open. If you are working on a file that has already been named, the Shortcut and Mouse method will not cause the dialog box to appear. your document's formatting will be lost. 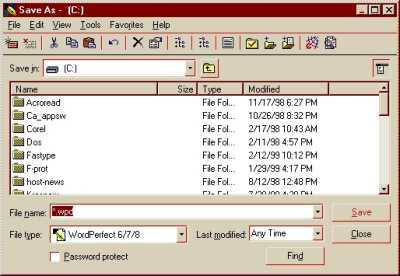 Close to exit the current document but leave the WordPerfect program open. Exit to exit any open documents, and then exit WordPerfect. From the File menu, choose Close or (Shortcut) Hold <Ctrl> tap F4. not changed the document since the last time you saved it, the document closes. Yes to save the changes & exit the document. The program will remain open. All three methods will cause the Open dialog box to open. Select consecutive or sequential files. There are times when you have to work on more than one file at a time. Opposed to opening each file individually, try the following .. When you do have more than one document opened, you of course need to move between them. As usual there is more than one way to accomplish this. Tap the number of the file you want to access.